Made of a soft cotton rope. Perfect for playing, mental stability, ect. Medium is suitable for amazons, african greys, cockatoos, pionus ans similar sized birds. Small is suitable for cockatiels, senegals, caiques and similar sized parrots. 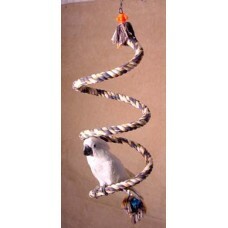 Xtra small is suitable for canaries, finches lovebirds and similar sized birds.